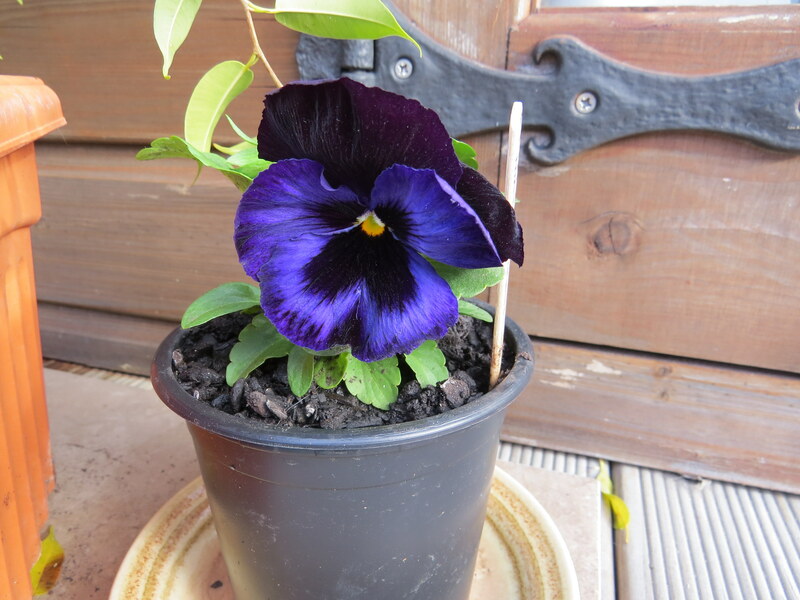 Pansies are one of my favourite flowers. Their sweet faces brighten up the winter garden, and I especially love them in shades of purple and blue. 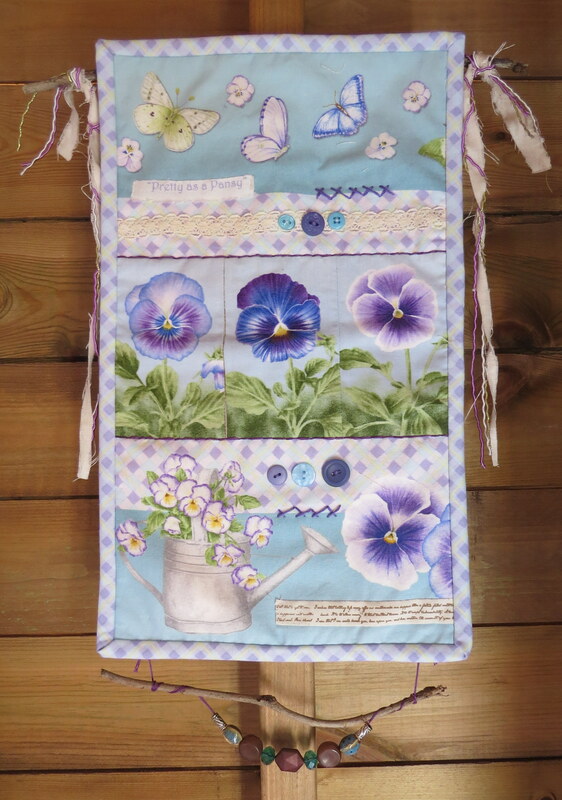 When I saw this pansy fabric on Grandmother’s Garden Patchwork & Quilting website, I immediately began planning what I could do with it. I made a patchwork table runner to cover my art table when I’m not using it. Then with the leftover fabrics, and strips cut from the coordinating picture panel, I made a small wall hanging. 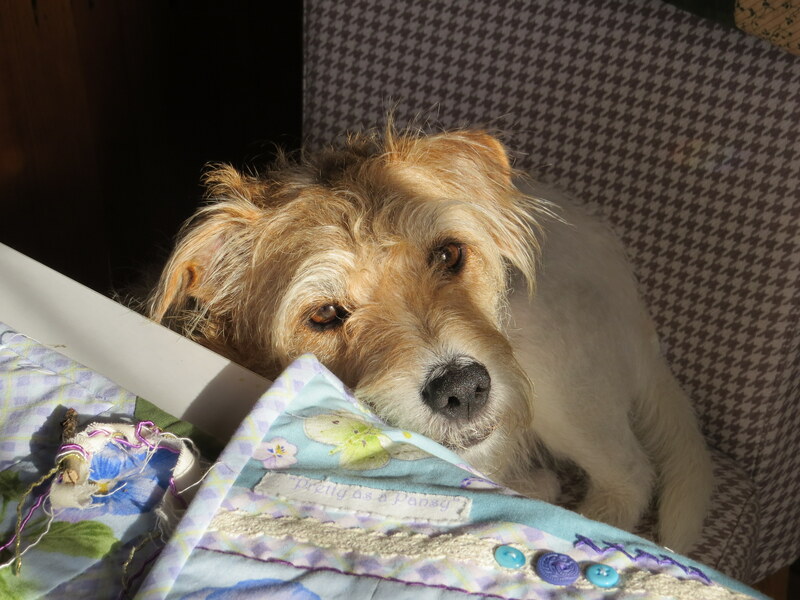 I added some buttons, lace, and stitching, then I found two sticks in the garden – one from which to hang it, and one from which to dangle beads at the bottom. Finn kept an eye on what I was doing. 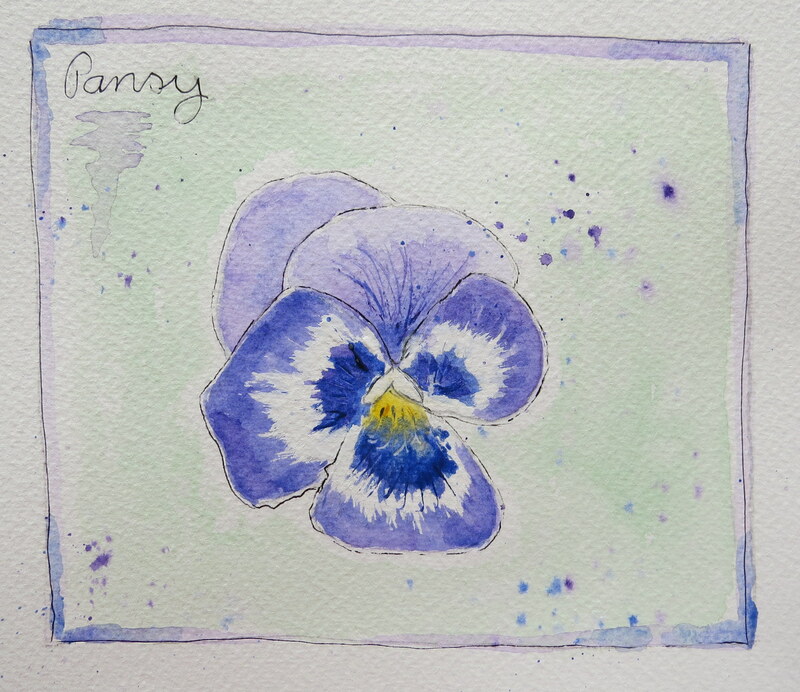 This sweet pansy is called Matrix Denim. 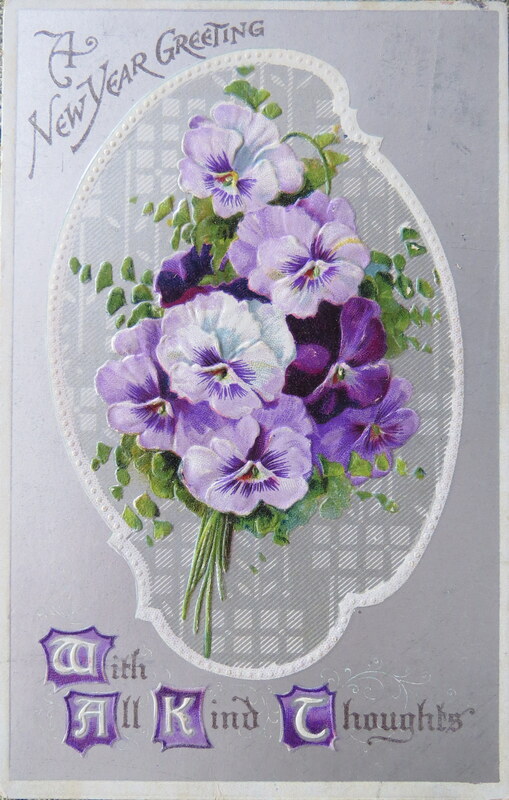 In the language of flowers, pansy means friendly thoughts or think of me. 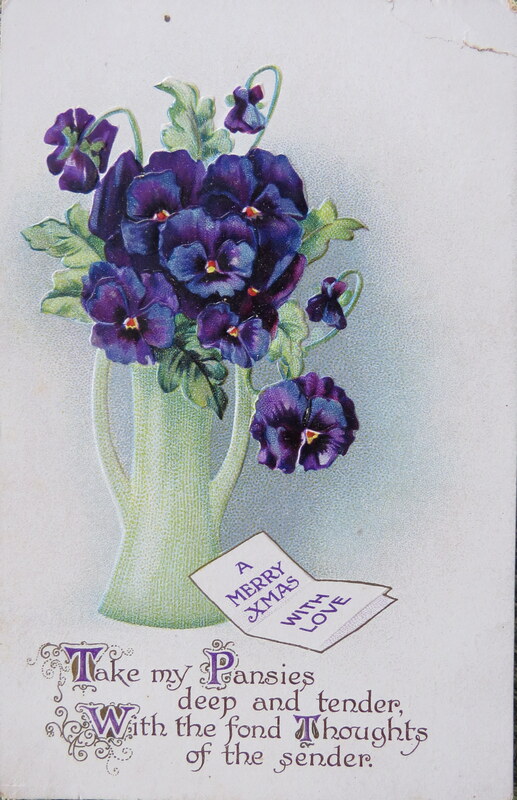 These pansy cards are from my collection of vintage greeting cards. With friendly thoughts from me to you, wherever you are in the world. There is still lots of colour in our autumn garden. 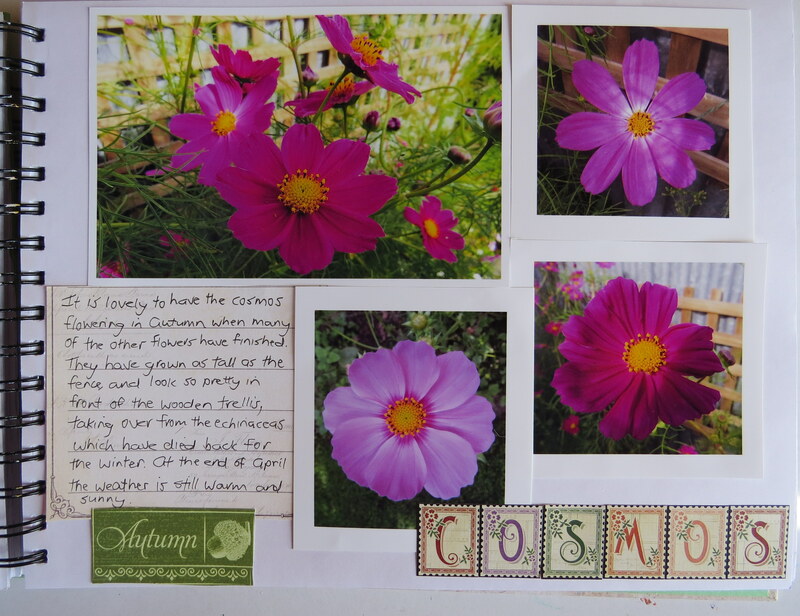 Taking pride of place is the pretty cosmos, which is flowering after many of the other plants have finished. 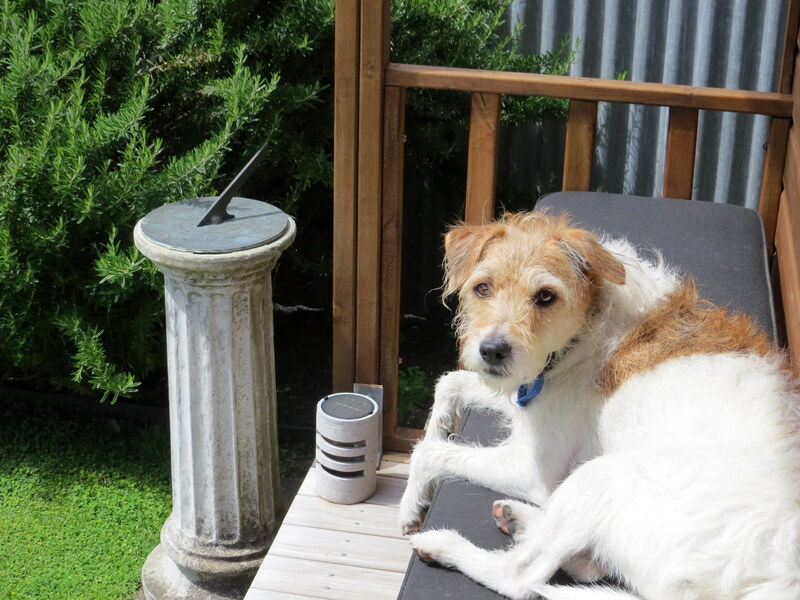 The weather is still warm and sunny, although we had a cyclone sweep through the country the day before Easter. It caused much destruction, with trees uprooted all over the town, including, sadly, our own lime tree, which we planted about ten years ago. In its place we have planted a bay tree, which we had growing in a pot, but it should do much better now it is in the ground. I have planted a Camelia sinensis to have a go at growing my own tea! From the one plant you can make green tea, black tea, or oolong tea, depending on how the leaves and buds are processed. The winter vegetable garden is planted with broccoli, cauliflowers, cabbages, lettuces, spinach, kale, and silverbeet. I still have leek seedlings to go in. I haven’t tried growing leeks before, so it will be interesting to see how they do. 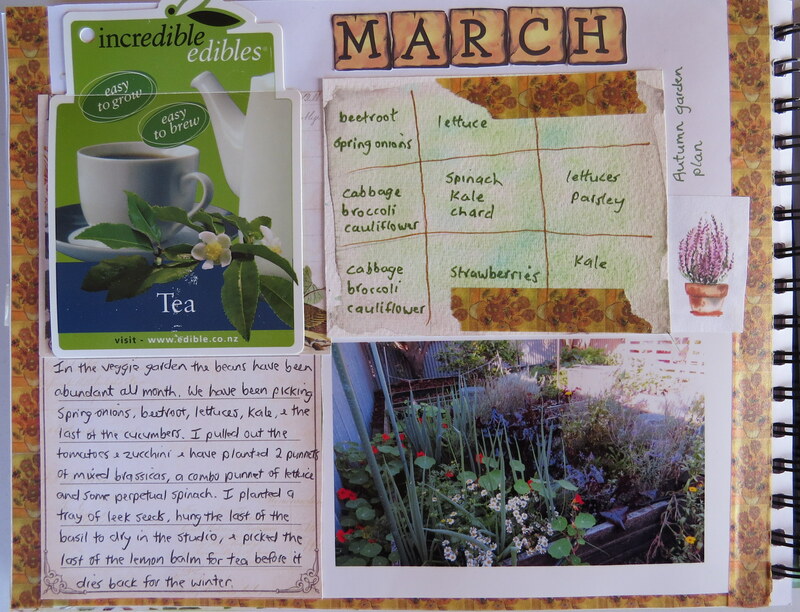 These are my garden journal pages for March and April. A book I have enjoyed reading this month is A Cottage and Three Acres by Colette O’Neill. 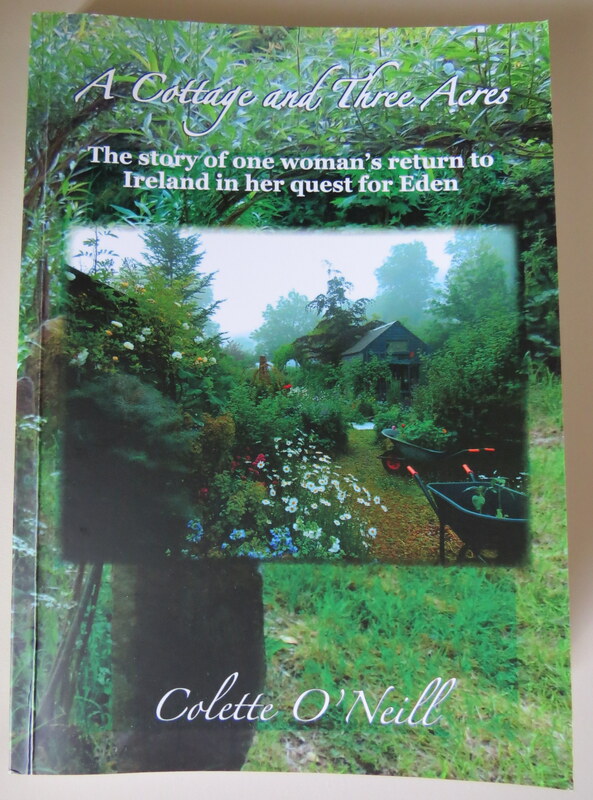 Thirteen years ago Colette left behind her life in London to begin a new life in Ireland. 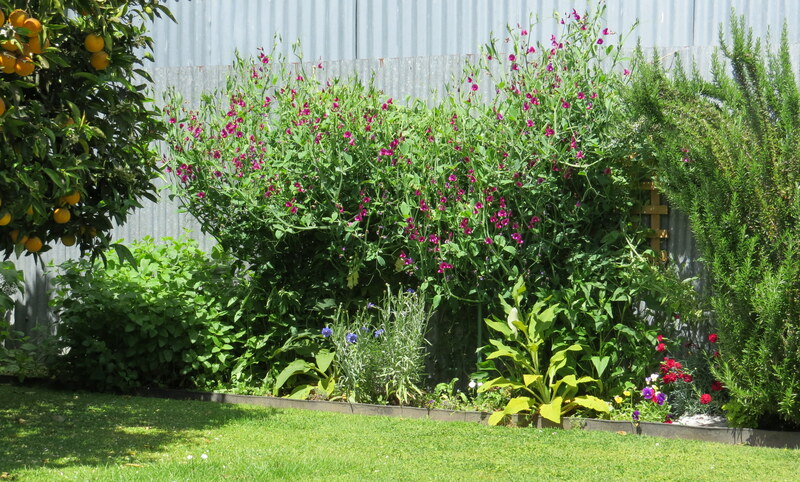 She bought an old cottage with three acres of bare, wet, rushy land and set about transforming it into a beautiful, lush, permaculture garden, planting thousands of trees, as well as herbs, vegetables, and even a fairy wood. The book tells the story of what one woman with a dream can achieve on her own, and how a woman’s love of nature and incredible affinity with Mother Earth was able to heal, in her words, “Some of the saddest looking land I had ever walked upon.” Colette truly is an inspiration and I would recommend this book to anyone with a love of gardening, and of nature. 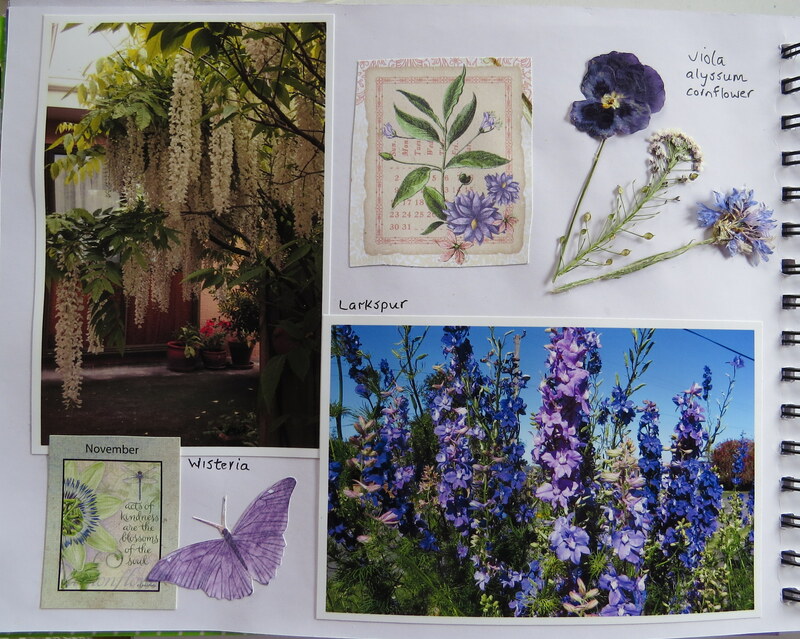 Colette has thousands of pictures of her garden and cottage on her website bealtainecottage.com and hundreds of videos on YouTube. Her book can be purchased through her website, and she is happy to sign it for you! It has been a busy month in the garden, in these last weeks of summer, with our vegetable garden cropping abundantly. We have been picking salad greens, beetroot, spring onions, tomatoes, basil, beans, cucumbers, cabbages, zucchinis, and strawberries. I was worried last month that we weren’t going to get many tomatoes as they were small and the birds were eating them as soon as they ripened. But what they lacked in size, they have more than made up for in quantity, and after one week of pecking, the birds have left them alone – not sure why, they must have found something tastier to eat elsewhere. 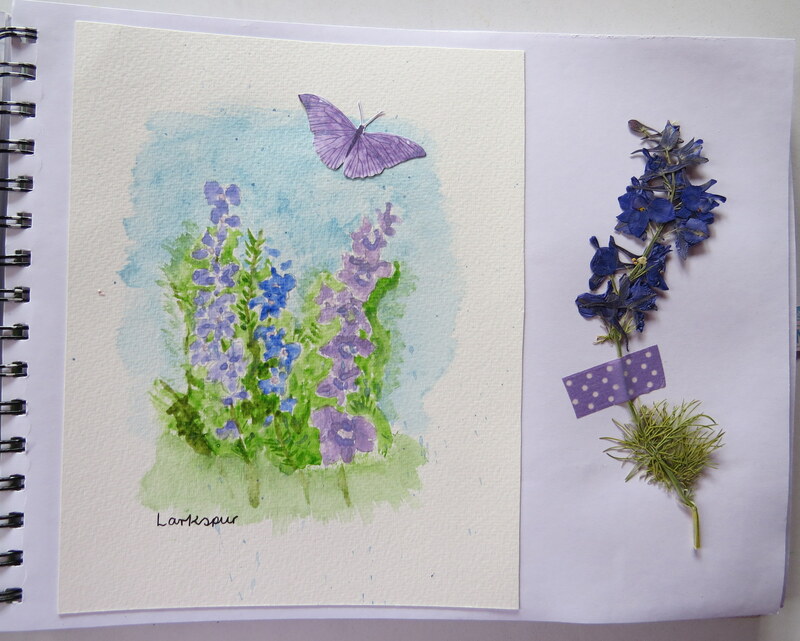 I have made several batches of pasta sauce, bottled enough beetroot to last through the year, frozen loads of beans, dried herbs for use in body care products and for herbal teas, pressed flowers to use in my art, and had a go at eco-dying with plants. 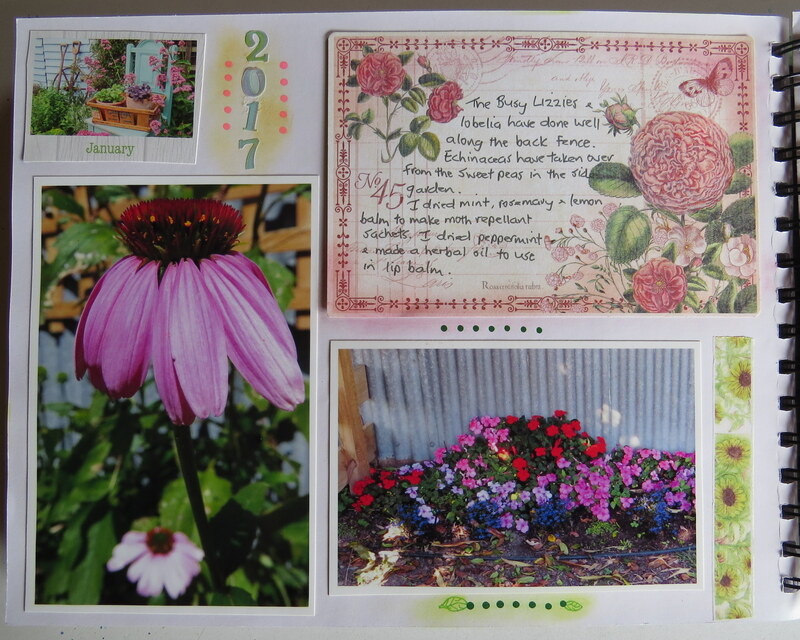 These are my garden journal pages from last month and from this month. 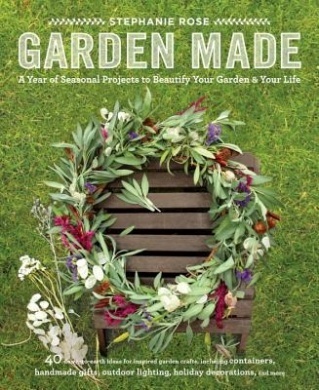 I wanted to share with you a lovely book that I got for Christmas – Garden Made: A Year of Seasonal Projects to Beautify Your Garden and Your Life by Stephanie Rose. 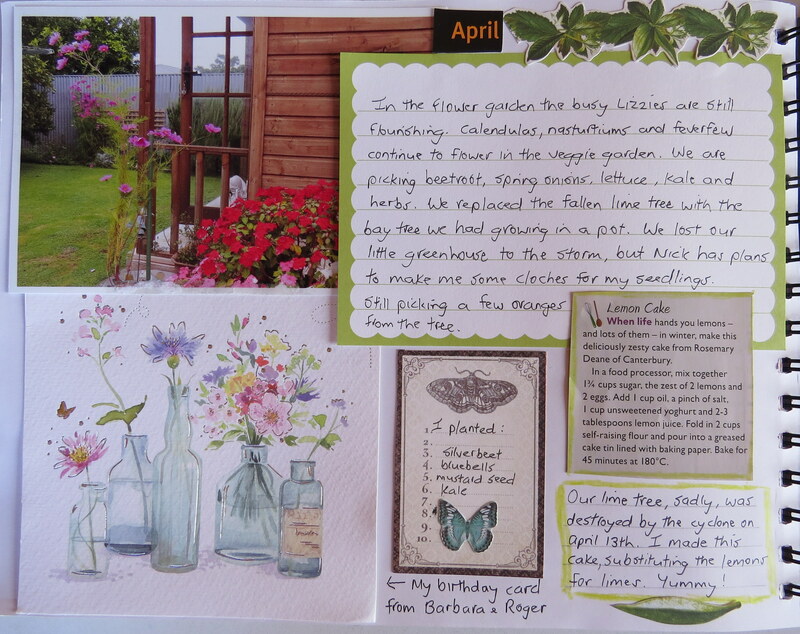 Stephanie is a master gardener who became interested in gardening after a debilitating illness. 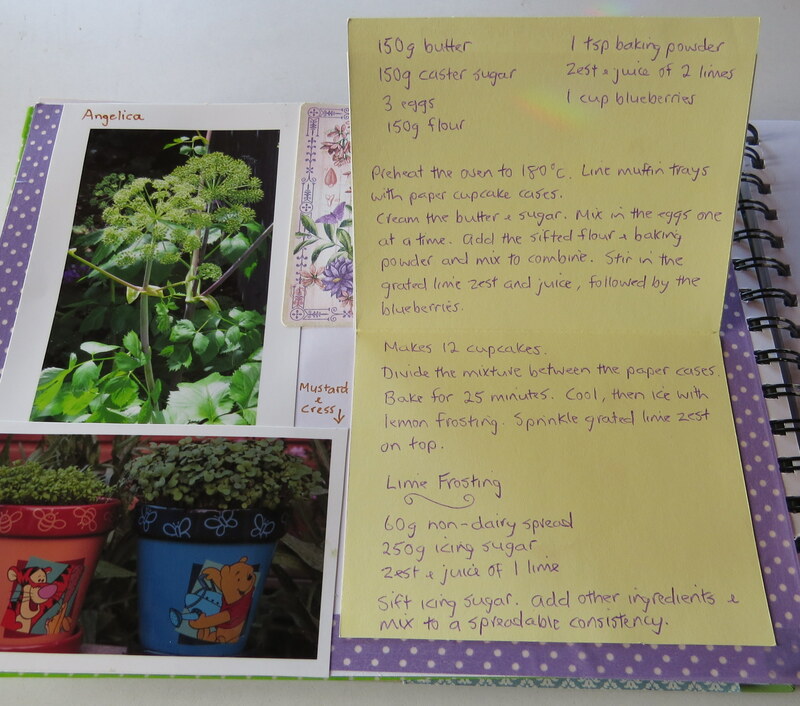 She writes the blog Garden Therapy where she shares garden-related projects from making your own herbal skincare products, to growing food, recipes, and crafts. 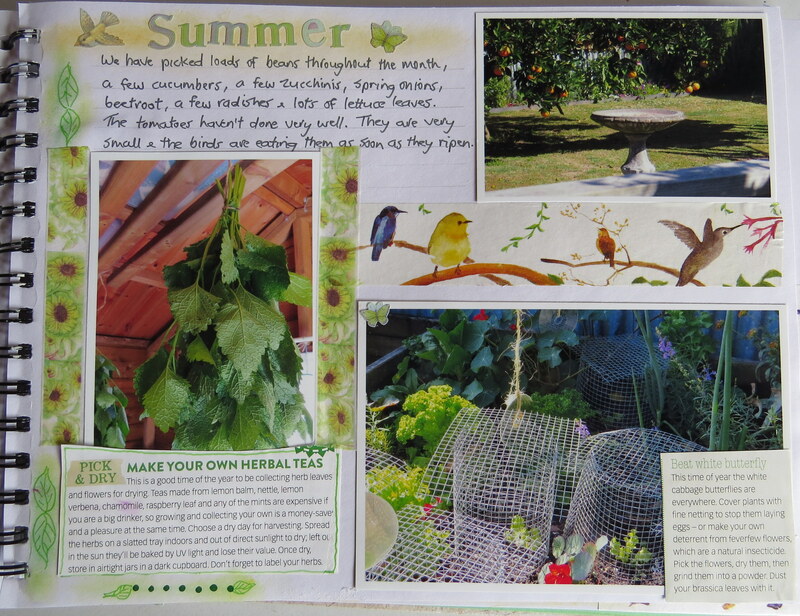 The book has fun projects to make, season by season. 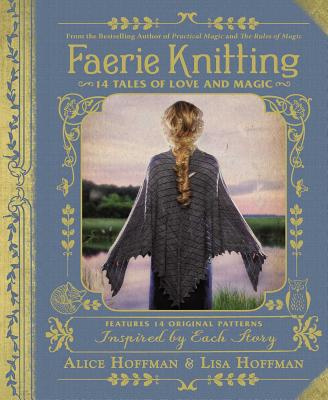 It has lovely pictures and is chock full of inspiration. Some of the projects I am looking forward to trying are homemade seed paper, teapot planters, terrarium ornaments, and a bug hotel. 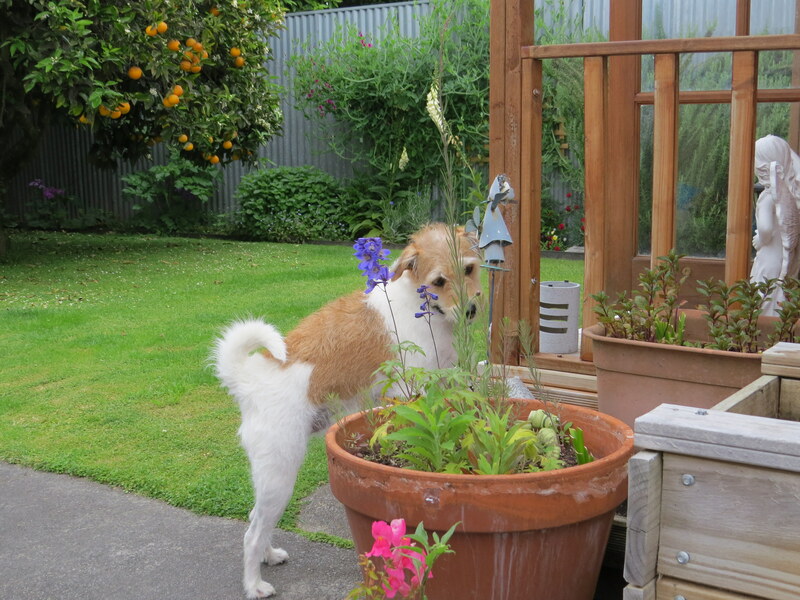 Wishing you all a happy day in your garden! 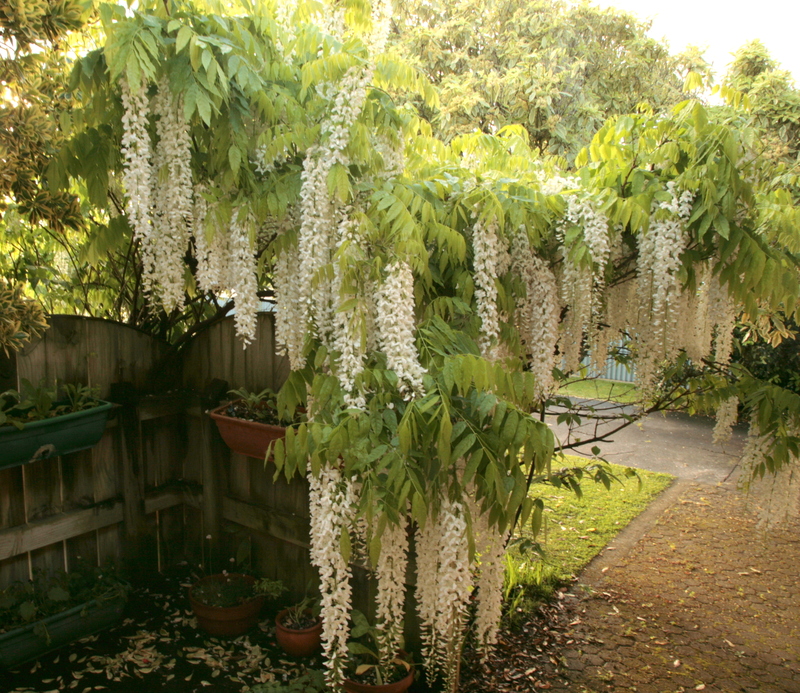 The month began with the wisteria in bloom over our front porch, dripping cascades of white blossom. It makes a lovely display, but is over in such a short time, lasting barely more than three weeks. With November being a windy month, the path beneath soon became a carpet of white petals while the tree filled out with dense, lush green foliage. 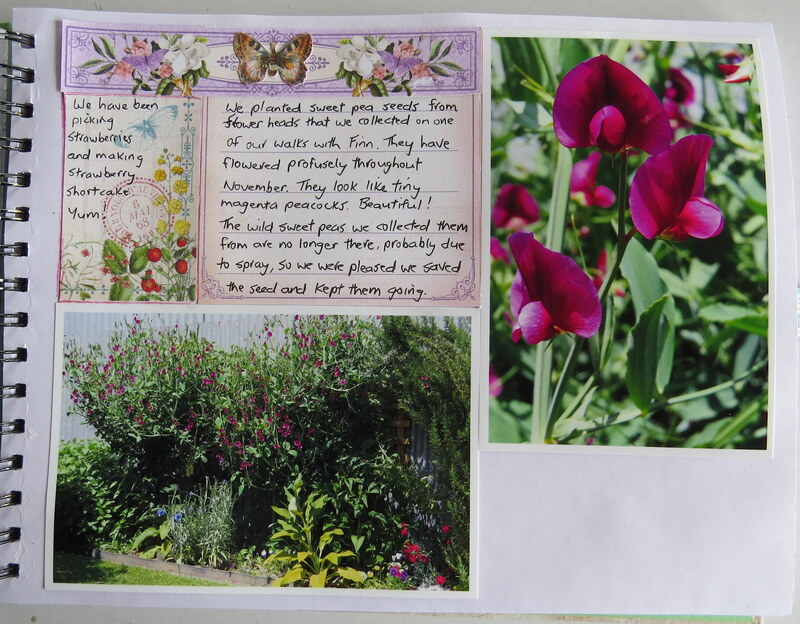 On one of our walks with Finn last year, we collected seed pods from wild sweet peas we found growing along a walking track. I planted a few along our side fence, with a trellis behind for support. 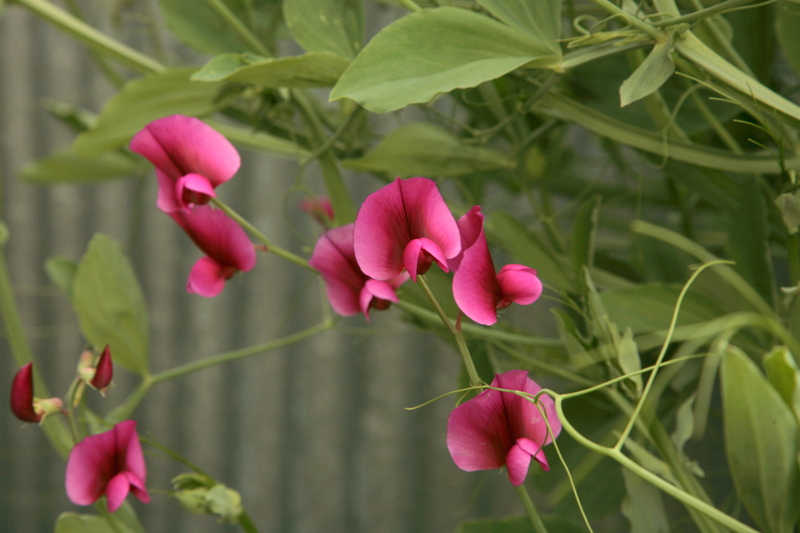 They are the most beautiful shade of deep magenta and have flowered profusely throughout November. 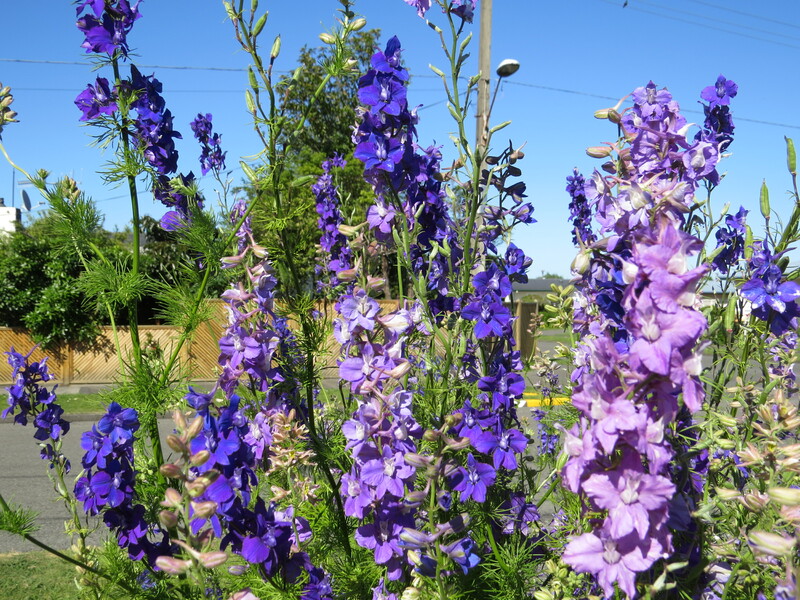 The larkspur in our front garden self-seeded from last year and have come up in lovely shades of blue and purple. 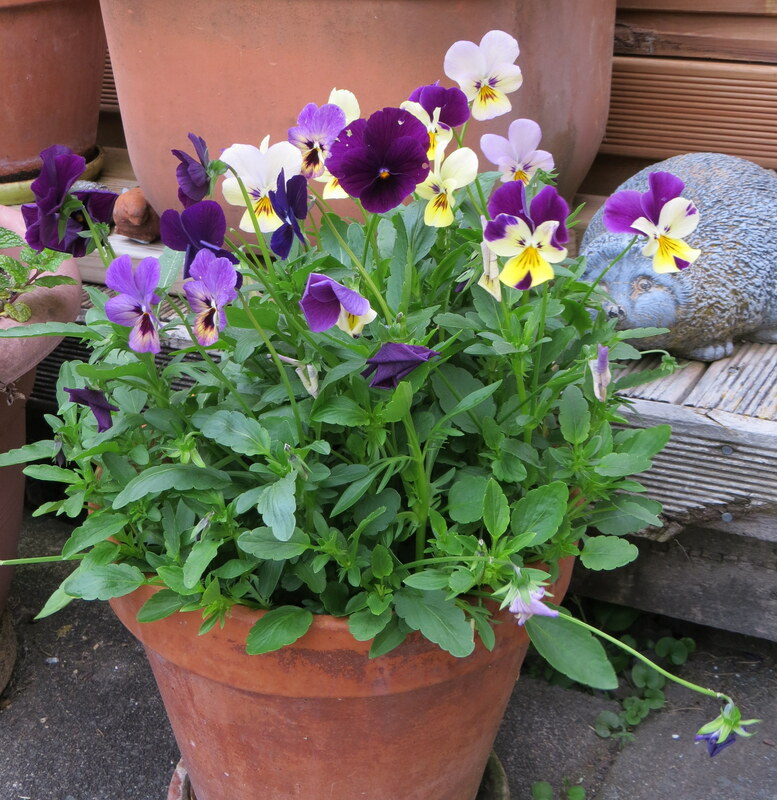 I grew violas from a packet of seeds and planted them around the garden and in pots. The strawberries are cropping abundantly now the warmer weather has arrived. We are enjoying them for breakfast and desserts. One of my favourite recipes to use them in is strawberry shortcake. Yum! 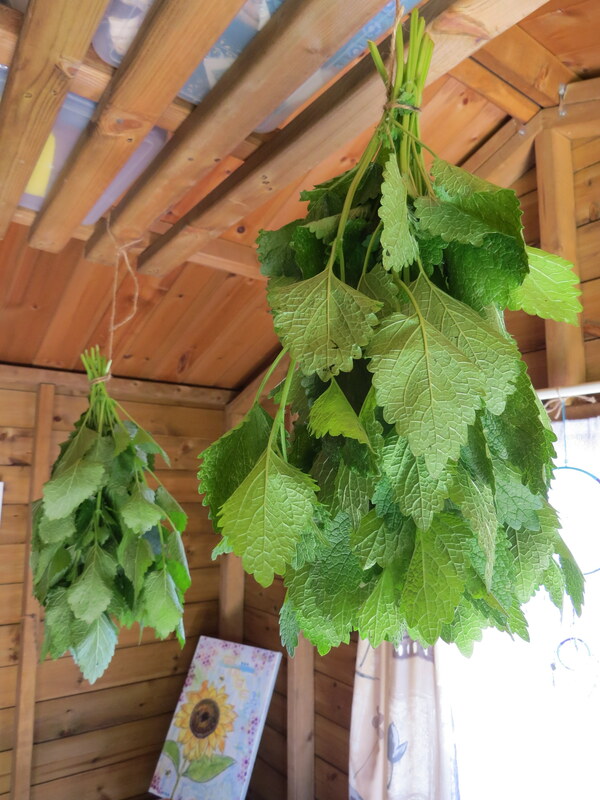 I have been drying lemon balm to use in herbal infusions over the winter. Lemon balm is a calming herb. It also has anti-viral properties, and can soothe an upset stomach. 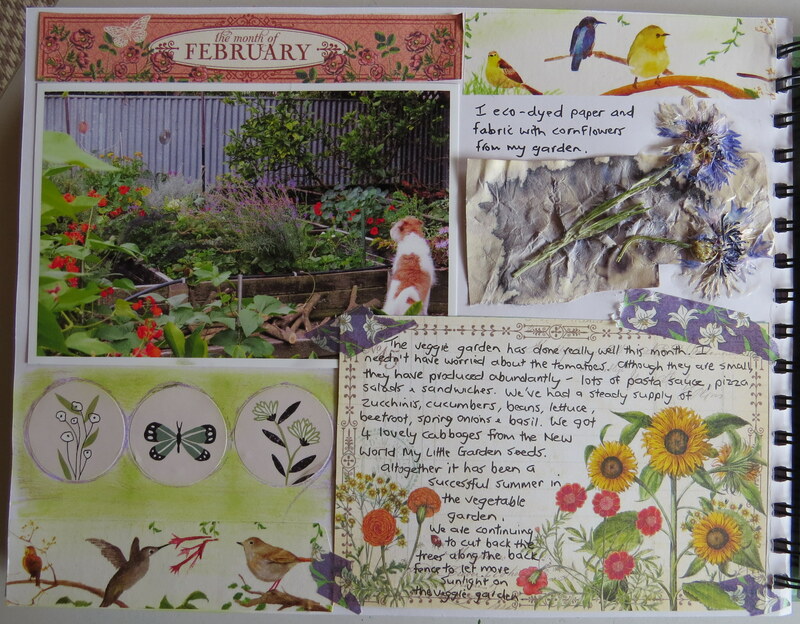 Pages from my garden journal. 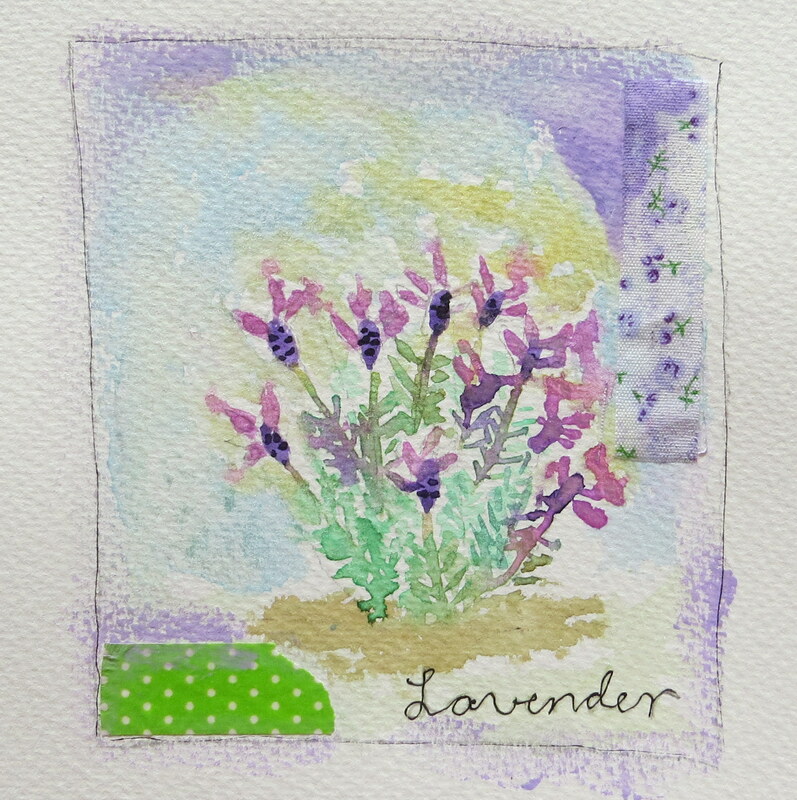 I pressed a few of the sweet pea flowers and have left a space on the journal page to put one when they are ready. 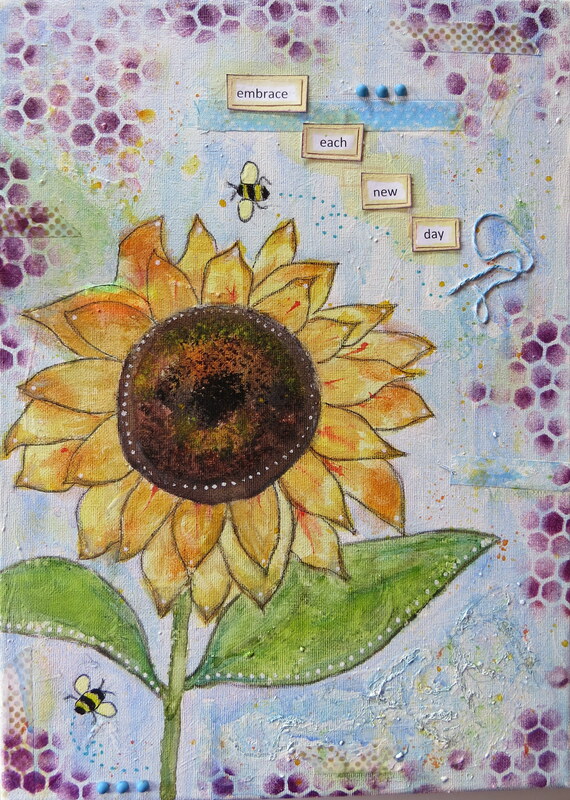 I hope you have a happy day in your garden! 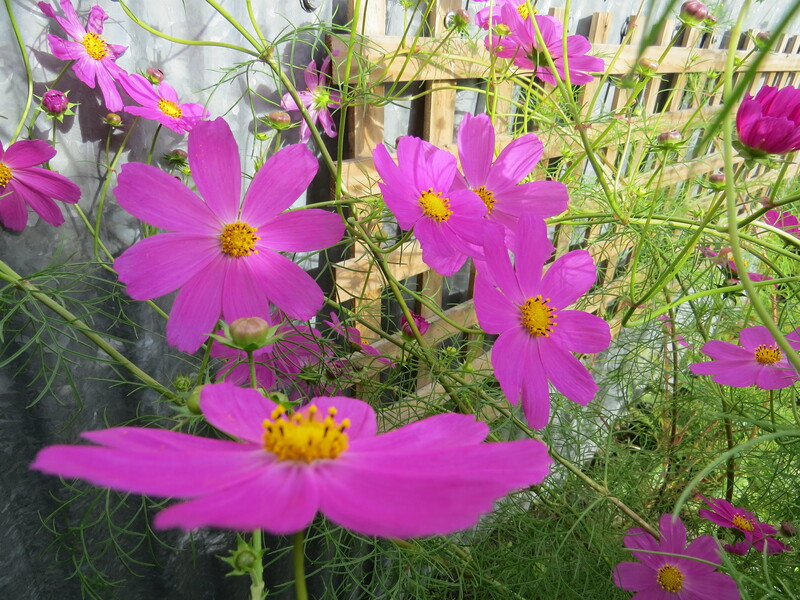 I love the month of October in the garden when there is a sudden surge of spring growth and new life bursts forth. At the moment our garden is filled with the divine scent of orange and grapefruit blossom, which is especially strong at night time. Most of the seedlings I raised in the greenhouse have been transplanted into the vegetable beds. 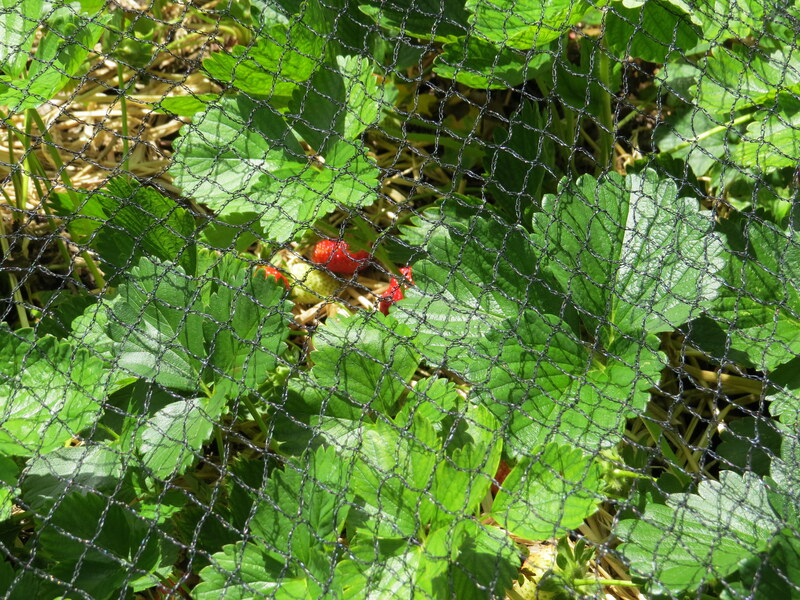 The bean plants are climbing up their strings, and the strawberry plants are covered in flowers. 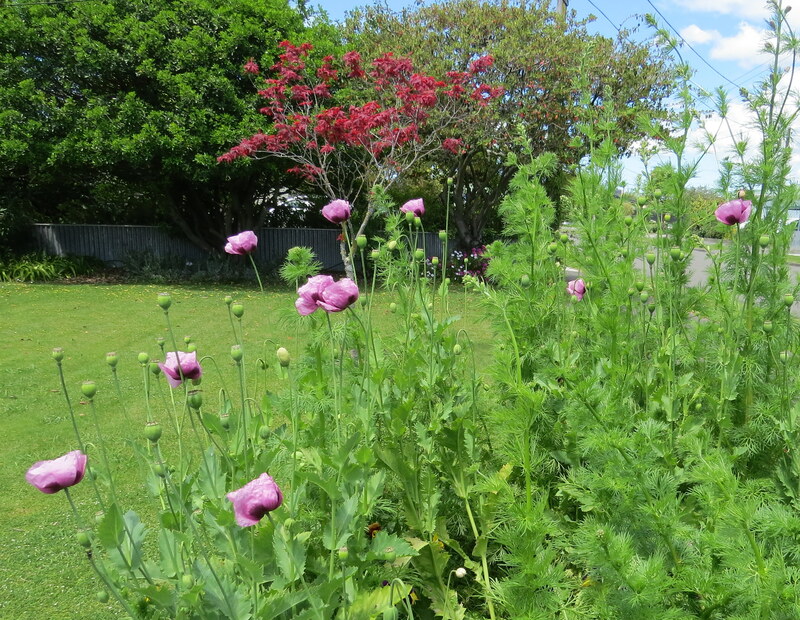 Poppies are blooming in the front garden. 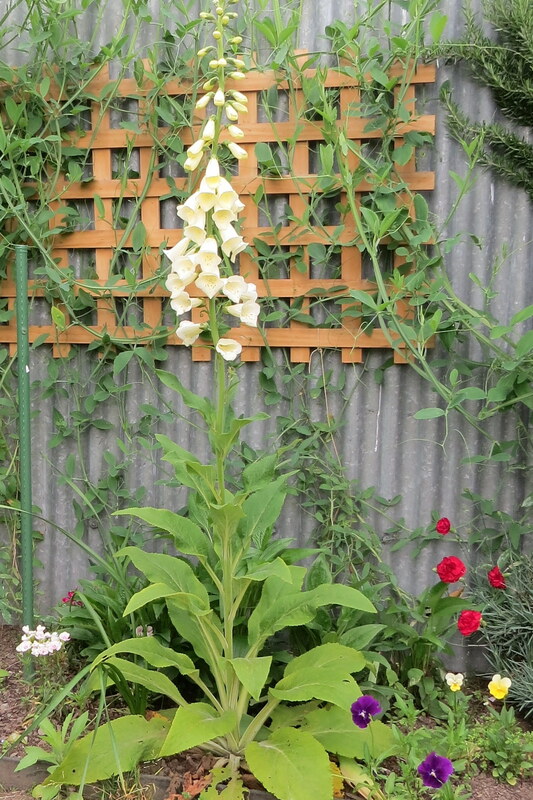 The foxgloves I planted last year are producing tall spires of pretty cream bell-shaped flowers. 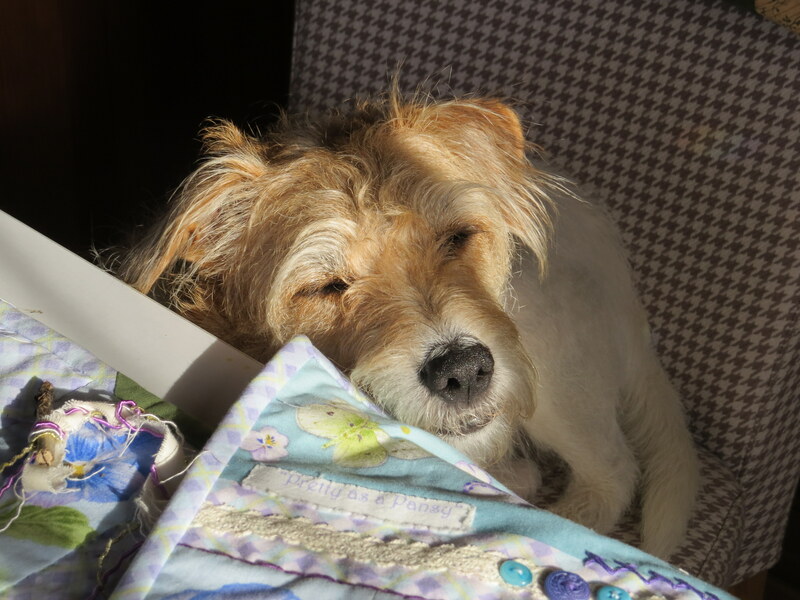 Finn loves to doze on the sunny bench seat outside the studio. 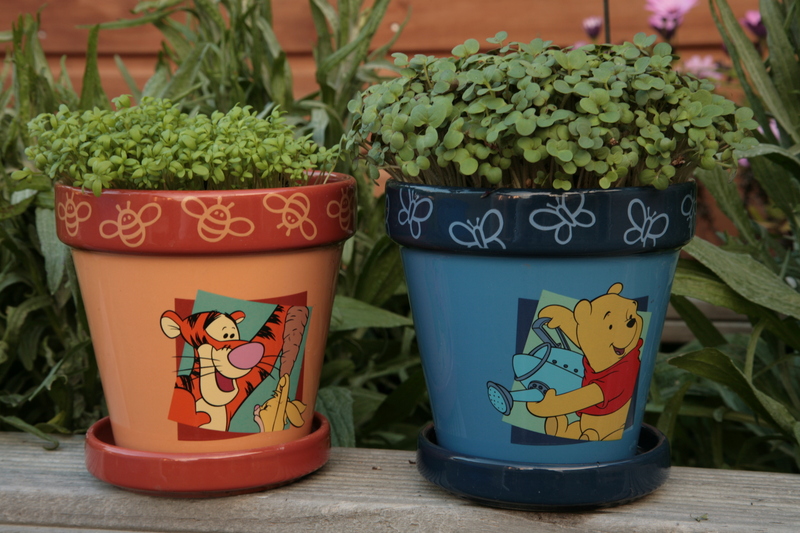 I planted pots of mustard and cress to cut for use in sandwiches and salads. 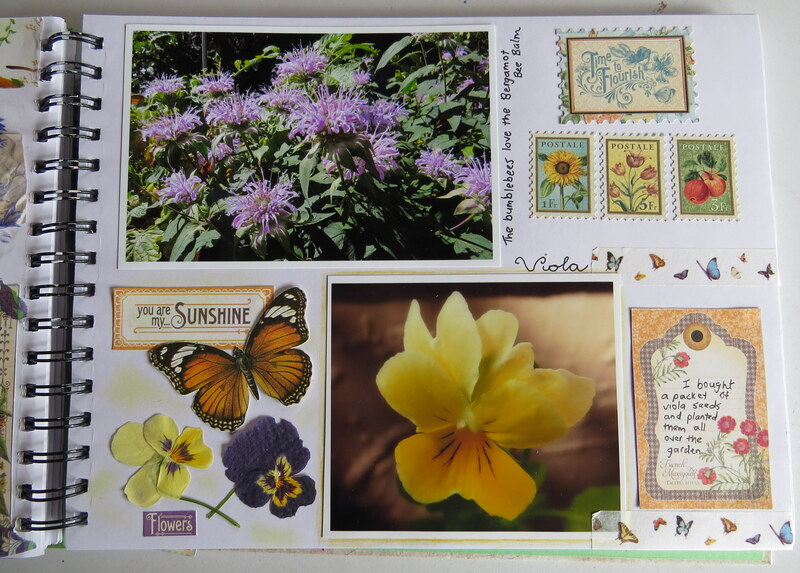 These are the October pages from my garden journal. 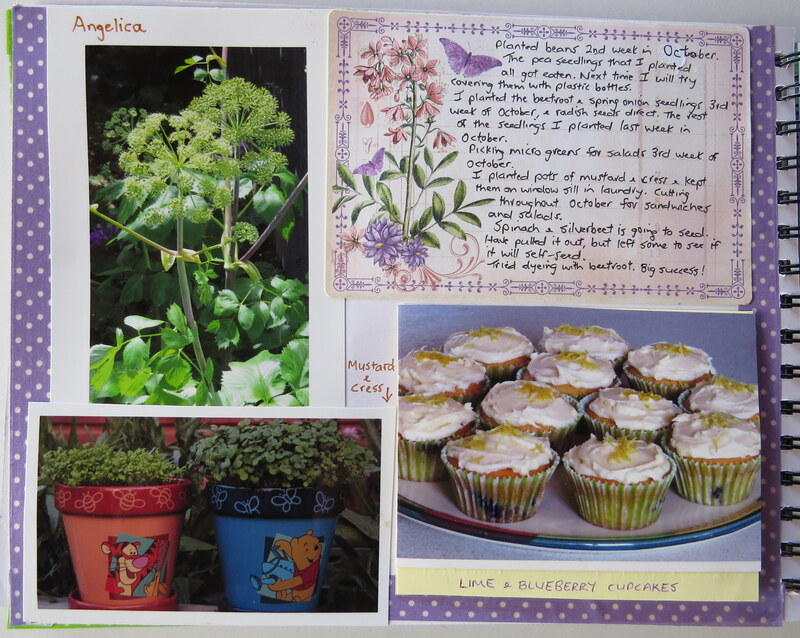 The card lifts up to reveal the cupcake recipe beneath. I hope, wherever you are, there is something blooming in your garden. My small studio in our garden warms quickly once the sun comes out and it is a pleasure to go out there on these cold winter days and lose myself in creative bliss. 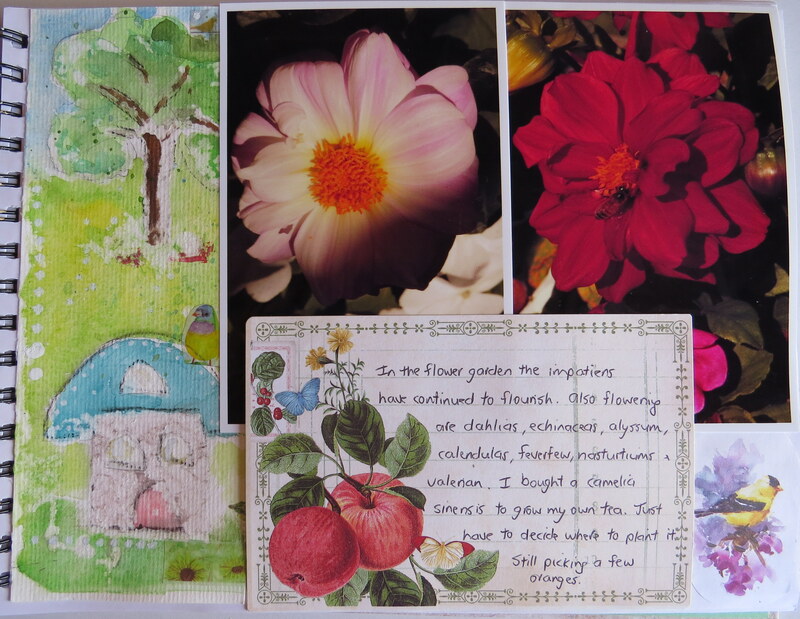 I painted a couple more watercolour flowers for my garden journal, but after a few days my flower a day project gave way to some mixed-media painting on canvases. 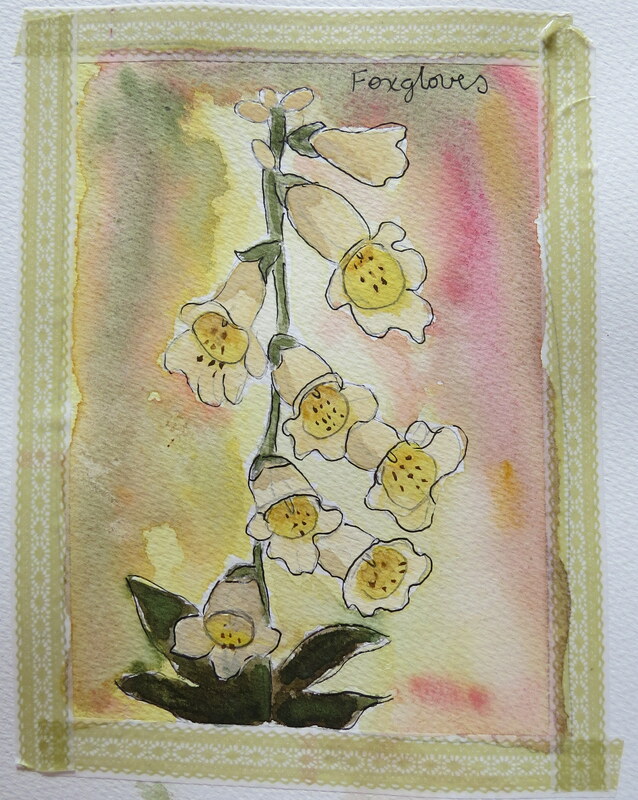 I will definitely be painting more watercolour flowers in the spring when our garden starts blooming with the seeds we saved and planted from last year – poppies, larkspur, snapdragons and foxgloves. 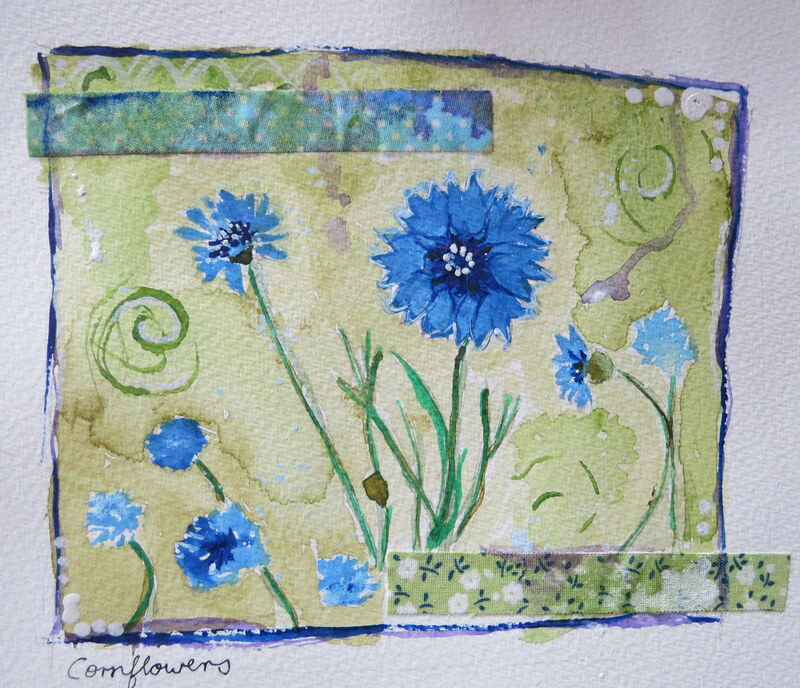 Although I enjoy trying new things, I always seem to return to mixed-media. 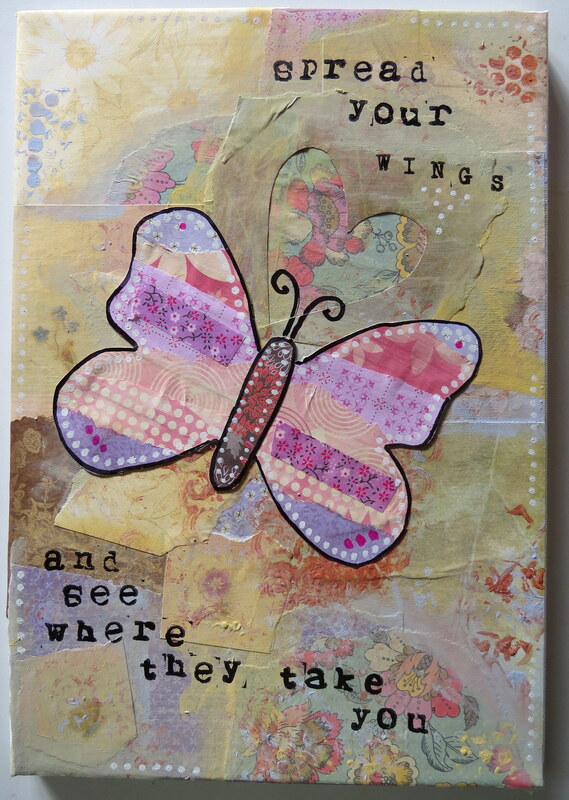 I just love being able to combine all my favourite things – paints and inks and scrapbook papers and fibres and fabrics and embellishments and collage and texture – together in one piece. Last weekend I went to a local fair where crafters were selling their unwanted supplies at bargain prices. 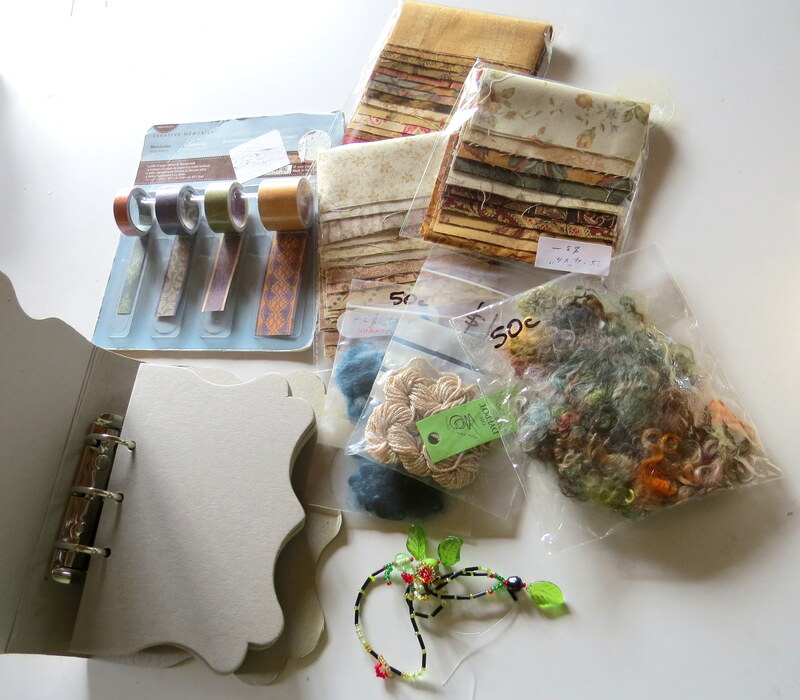 I got some lovely fabrics, fibres, tapes, a broken string of beads and a mini kraft album, all for next to nothing. I think the fair was a great idea to give crafters a chance to have a clear out of their stash. One man’s trash is definitely another man’s treasure! 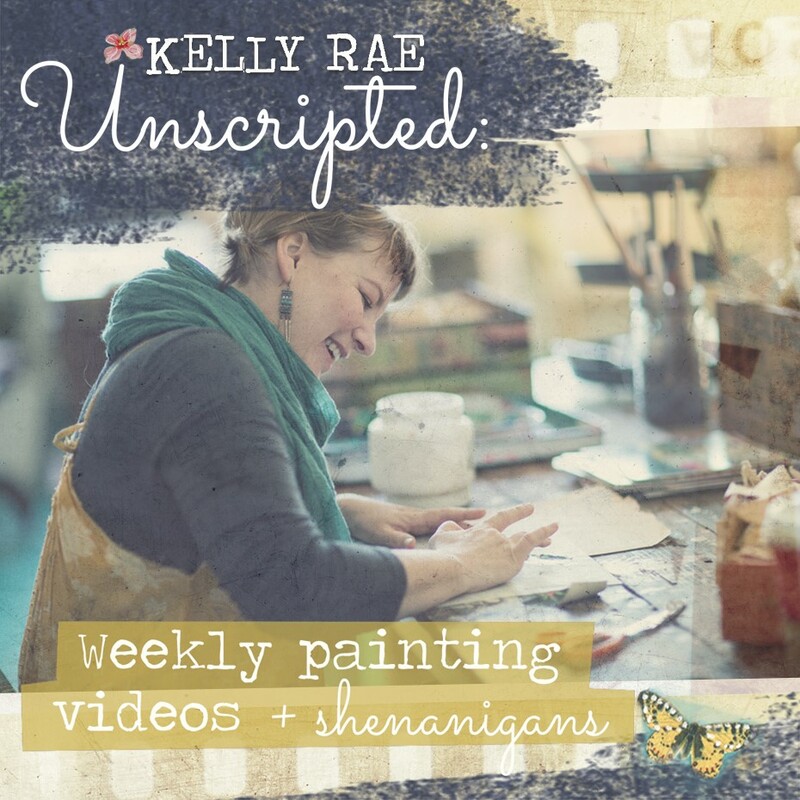 This month I signed up for Kelly Rae Unscripted with Kelly Rae Roberts. It is weekly painting videos of Kelly Rae painting in her studio. Each video is between one and three hours long and is unedited, showing her painting process from beginning to end as she creates a new mixed-media piece each week. She has a wonderful studio space in an old repurposed high school in Portland, Oregon. Sometimes she has her English bulldog, Lulu Butter Butter Bean, in the studio with her, and sometimes she has a guest painting alongside her. The videos are fun to watch. I am learning a lot of different techniques and getting loads of inspiration. Click here to learn more about Kelly Rae Unscripted, and here for Kelly Rae’s website. For those of you who are wondering about my next book, there is also lots of writing going on. An update about that soon. 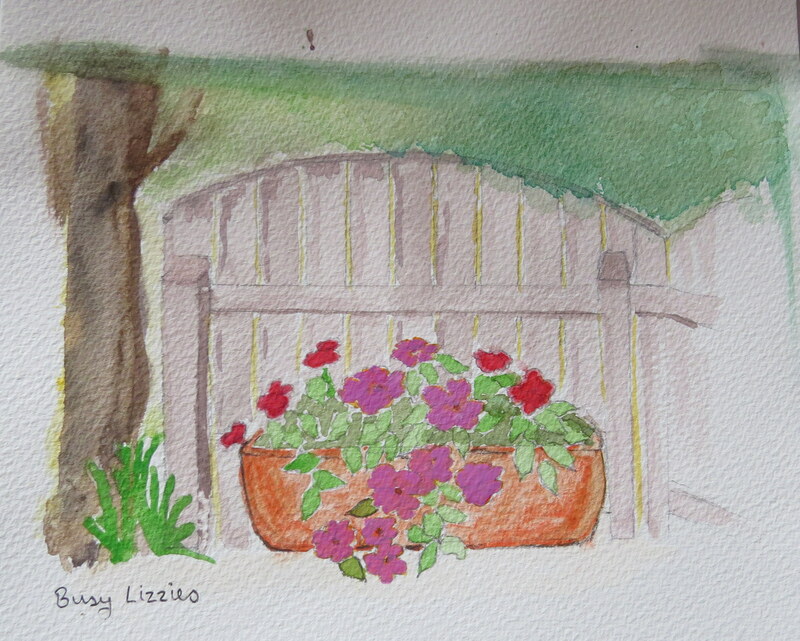 While it is mid-winter and there is not much going on in my garden at the moment to document in my garden journal, I decided to practice painting watercolour flowers. 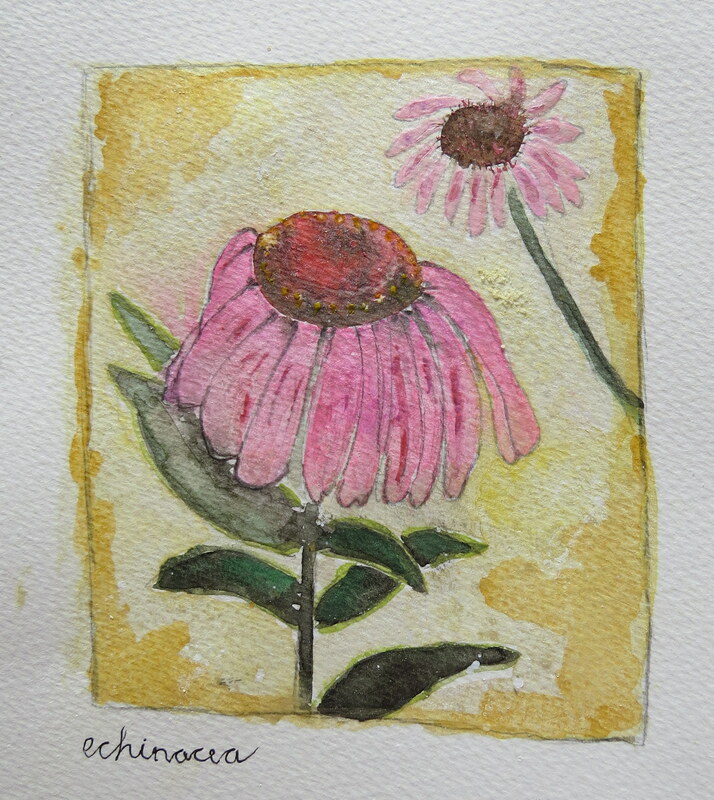 I have begun A Flower a Day project, challenging myself to paint a different flower every day. 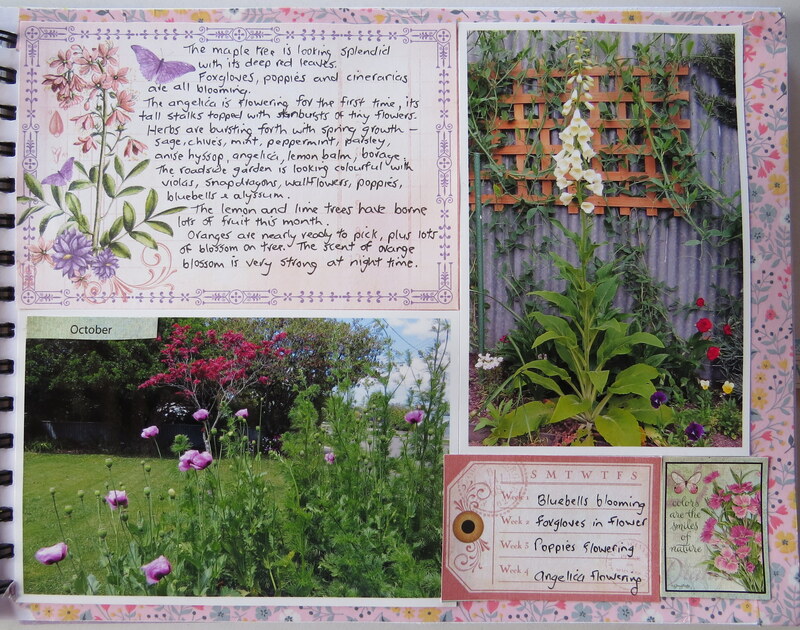 I paint them onto watercolour paper, referring to photos taken of my garden last summer, then I stick them into my journal. 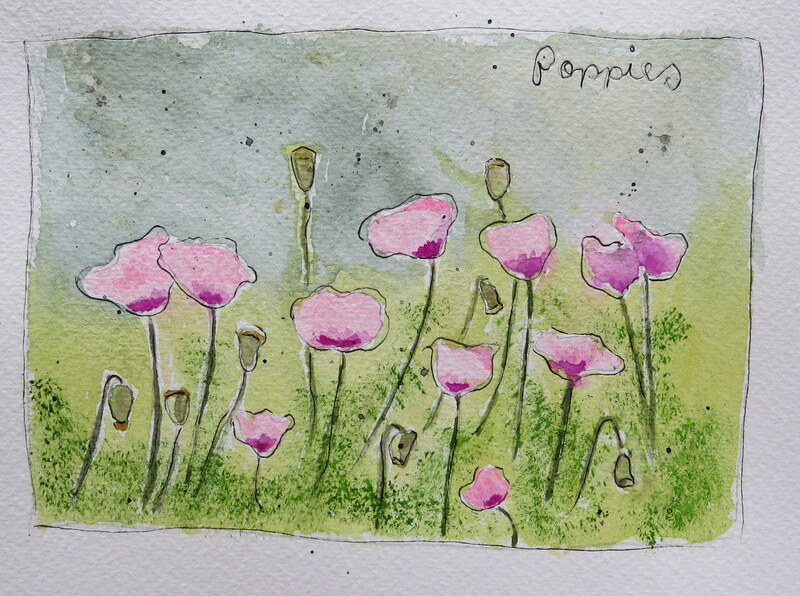 It is a good way for me to practice using watercolour paints and I am loving the process. 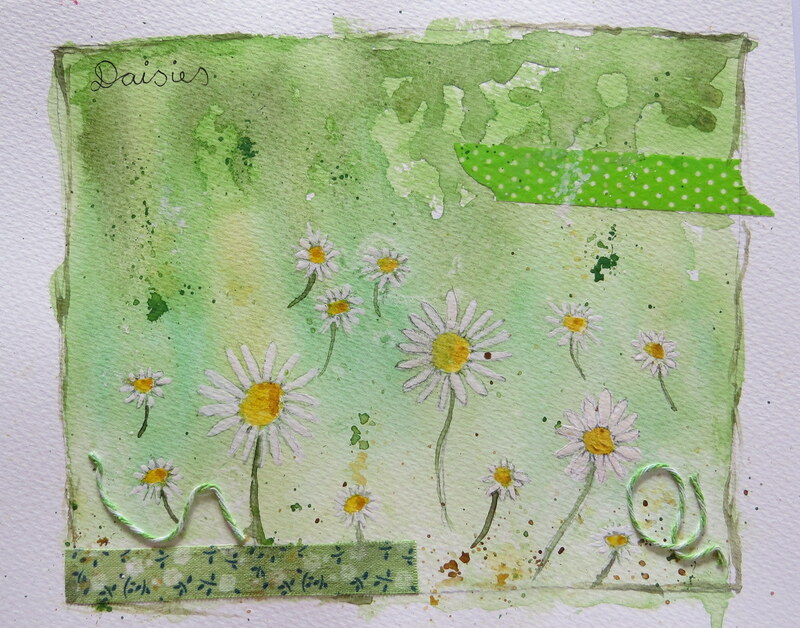 Sometimes I like to add mixed media embellishments, such as washi tape or fibres, to my mini flower paintings. This is what I have painted so far.